Certain breeds of dog are particularly heat intolerant. Brachycephalics are those dog breeds with a shortened nose, and a “pushed-in” appearance to the face: Bulldogs, Boxers, Pugs, Boston terriers, Lhasa Apsos, Shih Tzus and Pekingese are all examples. These breeds tend to have narrow nasal passages (stenotic nares), a narrow trachea (hypoplastic trachea), an overlong soft palate and other respiratory abnormalities, called brachycephalic airway syndrome, that can make it difficult to breathe on a good day. When the weather is hot, and brachycephalic dogs need to pant more to cool off, they can rapidly become overheated. On hot days these dogs should strictly be kept indoors, in a cool environment, with minimal outdoor activity and little to no exercise. Arctic, or northern, breeds such as Huskies, Akitas, American Eskimos, and Alaskan Malamutes have incredibly thick hair coats, which can provide warmth in frigid climates. There is some debate that these thick coats can also provide a cooling effect in the extreme heat, but there is no scientific proof that this is the case. Common sense dictates that these dogs, like those of any other breed, are susceptible to heat stroke and should be keept indoors when the temperature is high. 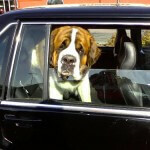 The risk for heat stroke is increased in other thick-coated breeds such as Newfoundlands, Great Pyrenees, Chows, Saint Bernards, and Bernese Mountain Dogs. 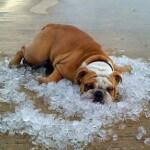 Overweight/obese dogs, and geriatric dogs are also more susceptible to the effects of heat. 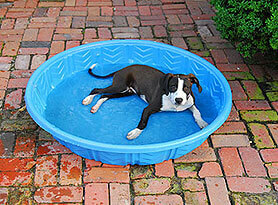 The reality is that all dogs, regardless of breed, are susceptible to heat stroke if the conditions are warm enough. 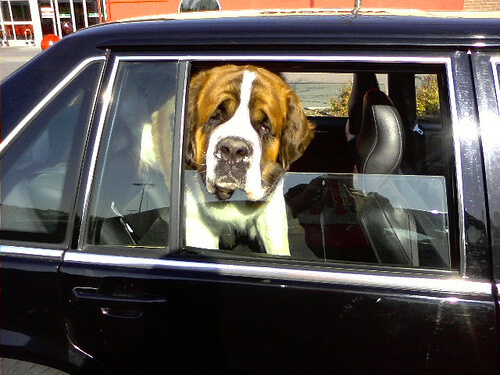 Dogs should never, never, never be left alone in a hot car, even with the windows cracked. On a 70 degree day, then temperature in a car can reach over 100 degrees in just minutes. Dogs should not be left outside in a yard on hot days, even if shade is available. 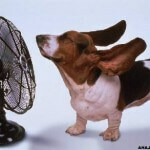 If your home does not have central air conditioning, leave Fido confined to a room with a window AC unit. If there is no air conditioning available, Fido should be kept in a basement or first floor room, with the curtains closed to block sunlight and a fan to keep him cool. Only take Fido outside for a short time to relieve himself; long walks, runs, and fetch could rapidly induce heat stroke. The symptoms of heat stroke in dogs can be subtle; more obvious signs often do not appear until the condition is life-threatening. A dog’s normal core temperature is approximately 101.0-102.5 degrees Fahrenheit. If your dog’s rectal temperature is over 105.0, on a hot day with no evidence of pre-existing illness or fever, then Fido is hyperthermic and at risk for heat stroke. Other symptoms include excessive panting with thick, ropy saliva, bright (brick) red gums, vomiting, diarrhea and weakness. If you identify these symptoms, call your veterinarian immediately. Until your dog can be taken to the vet, you can begin cooling him by hosing Fido or bathing him in cool water; do not use ice water as this causes the peripheral blood vessels to constrict, which can prevent the body from dissipating heat. 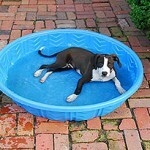 Rapid cooling can be dangerous to dogs with heat stroke. 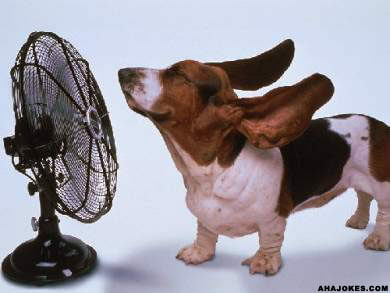 You can also cool Fido with a fan, and place cool packs in his groin and armpit areas. 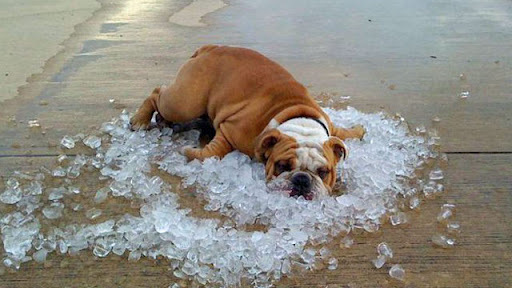 Take Fido’s temperature every 10 minutes during the cooling process and stop once his temperature reaches 103.0 degrees. The good news is that heat stroke can be easily prevented; common sense is the order of the day to avoid a hot dog!